1. A prince of the tribe of Simeon who, with others, attacked and captured Gedor, and settled there (I Chron. iv. 36). 2. 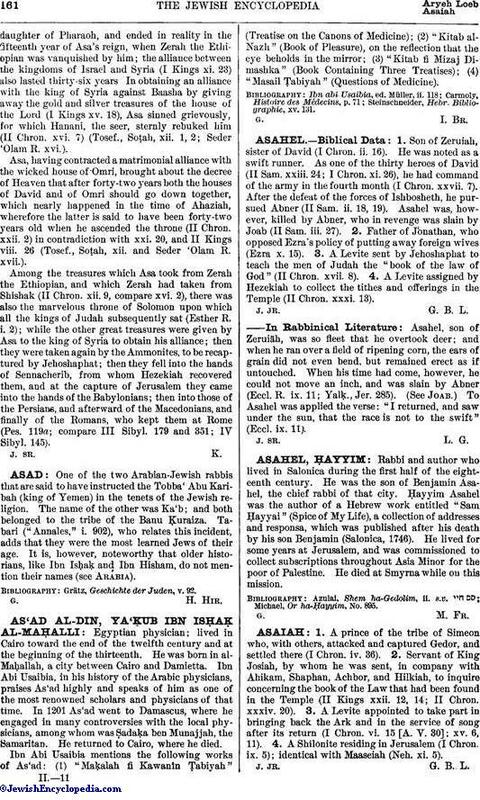 Servant of King Josiah, by whom he was sent, in company with Ahikam, Shaphan, Achbor, and Hilkiah, to inquire concerning the book of the Law that had been found in the Temple (II Kings xxii. 12, 14; II Chron. xxxiv. 20). 3. A Levite appointed to take part in bringing back the Ark and in the service of song after its return (I Chron. vi. 15 [A. V. 30]; xv. 6, 11). 4. A Shilonite residing in Jerusalem (I Chron. ix. 5); identical with Maaseiah (Neh. xi. 5).